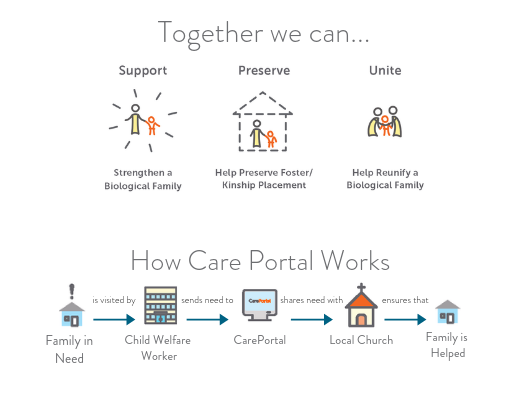 Hands of Hope is the Implementing Partner of CarePortal in Indiana bringing an innovative, online platform to the front line of child welfare. CarePortal brings the tangible needs of hurting children and families in your community to your attention. Department of Child Services case workers uncover critical needs. CarePortal makes local churches aware, giving them a real-time opportunity to respond. Together, we can change the lives of vulnerable children throughout Indiana. CarePortal is currently active in 19 states with over 1,789 churches serving children in their local communities every day. Want to see live updates on the impact happening in Indiana? Interested in supporting families in crisis within your county with your business? Consider becoming a County Sponsor for CarePortal in your county! What does it look like to be a County Sponsor? Access to real, vetted needs within your community with tangible ways to help. Financially give to a cause that is actively changing the lives of children in your backyard! 3. Be featured on the Hands of Hope website, CarePortal website, and receive social media highlights.